SoundRoots World Music & Global Culture: Monday's mp3: You talkin' smack about my ukulele? Monday's mp3: You talkin' smack about my ukulele? I'm remiss in posting this. Back at the beginning of the year, my friends at Mountain Apple Company sent over a cornucopia of stuff relating to the late, great Israel "IZ" Kamakawiwo'ole. 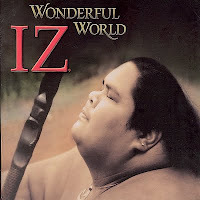 As you probably know, IZ passed on in 1997, and his body lay in state at the state capitol, only the third person in Hawaiian history to be awarded this honor. He was that famous. And he was famous for being a great musician. Who hasn't heard or seen the video of his version of "Somewhere Over the Rainbow" or "What a Wonderful World"? And who hasn't found a tear in their eye or a lump in their throat? There's just something about that warm voice, and the sweet sincerity behind it. IZ started his professional career in 1970, when his brother Skippy landed a job on a tourist boat and invited Israel to join him. Some nights, according to the biography IZ: Voice of the People, he could make as much as $10 a night. Which isn't so bad for an 11-year-old kid with a ukulele. Remember, this was back when the ukulele wasn't as cool as it is today, with folks such as Eddie Vedder and even that young upstart Jake Shimabukuro jumping on the four-string bandwagon. [IZ] played and sang. Then he got down and lumbered over to the edge of the stage and looked down at Governor Waihee, who was among local big shots in the front row. 'Hey Goberner,' IZ asked, 'when you gonna give da land back to da Hawaiian people?' The crowd went nuts. The governor looked embarrassed and tried to smile it off. IZ came to the cause of Hawaiian sovereignty later than his brother Skippy, but later became a strong voice for his culture, prompting one writer to (perhaps excessively) call him "the Bob Marley of Hawai'i." Had he managed to beat his weight/eating issues and survive past the age of 38, one can only imagine how much richer his musical legacy would be today. Fortunately, many are keeping his music and memory alive. 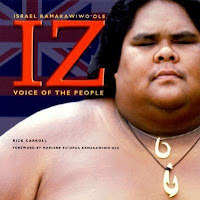 [mp3] Israel "IZ" Kamakawiwo'ole: "Henehene Kou 'Aka"